Each page template has rules that determine for what type of pages it should be applied. Every template may have multiple rules or no rules at all, which allows you to apply it globally or individually. Rules defined for page template have global effect. E.g. if you set rule to apply it for Page post type, then it will be applied for all pages across a whole website. For each post, page or custom post type as well as standard and custom taxonomy term, it is possible to define custom template rules. This metabox appears on edit post or edit term pages. These rules take priority over global rules. It is possible to disable applying global page template by picking "Disable Custom Template" option for Template field. Additionally, Custom Template metabox notifies about possible global rules that may be applied for the current post or term. Determines either this rule is enabled or disabled. Possible options: Enabled, Disabled. Sets the order of global rules to be considered for the currently requested page. Rule with a lower number will be processed first. It is a numeric value from 1 to 999. This is the actual page type to which the current template should be applied. Read more about request types in this article. Allows to limit the coverage to the selected post categories, tags or custom taxonomies assigned to a post type selected for Request option. Evidently, this option is available only if one of the post types has been selected for Request option. Allows to limit the coverage to the selected post formats only. Available options: Standard, Image, Video, Quote, Link. 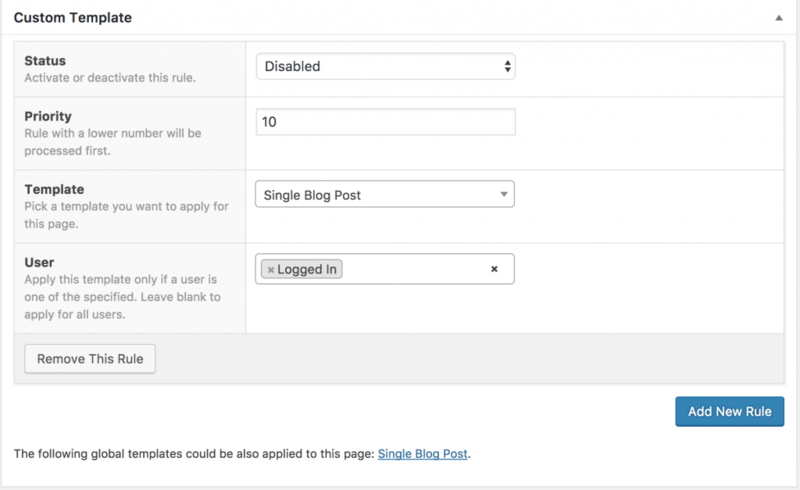 This option is available for the regular blog posts (post type "post") only. Allows to limit the coverage to the selected user conditions only. Available options: Logged In, Logged Out and all available user Roles. 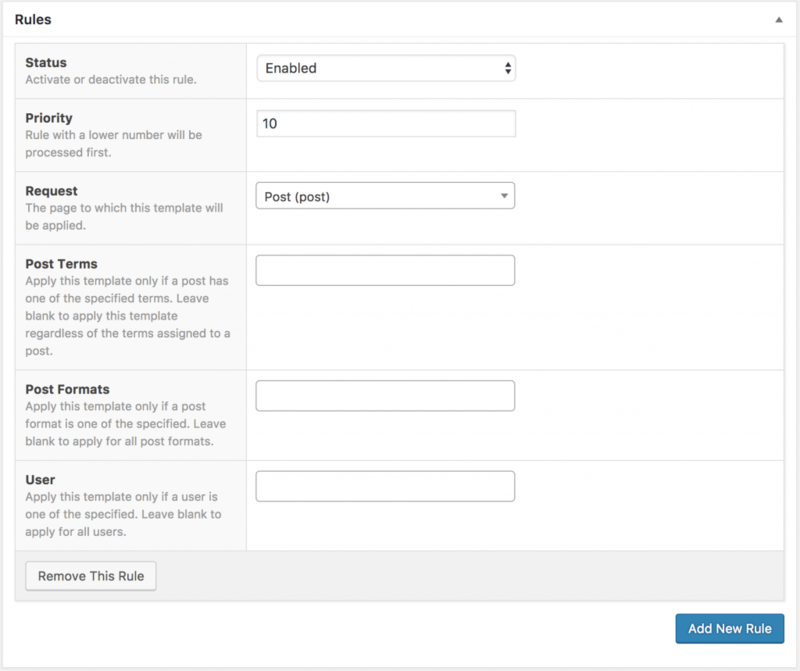 Sets the order of custom rules to be considered for the currently requested page. Custom rules are always processed before global rules, so this priority sets the order between custom rules only. A rule with a lower number will be processed first. It is a numeric value between 1 and 999. Default - allows to bypass custom template rules in order to apply global rule. Disable Custom Template - disables global rules for this particular post or term.